A heavy snowstorm in Howell can create a significant obstacle on a property, whether it’s a residential driveway or a commercial parking lot. Snow removal and ice management is a necessary process here in Michigan during the winter storm season. At RainMaker Irrigation, LLC, our team provides snow plowing and salting service to businesses and homeowners in Howell. Here are a few tips we would like to share about managing this never-ending winter chore. It is good to remove the snow down to the pavement within 18 hours, but definitely within 24 hours. Sometimes it may take multiple sessions in addition to salting to deal with thick layers of ice. Not everyone has the ability or wants to do the backbreaking task of snow removal. Many don’t have the proper equipment to effectively keep up with the job regularly. Unfortunately, it will be more difficult later if the snow and ice are not removed regularly. Professional snow removal and ice management service is the best way for homeowners and business owners alike to keep it all under control. RainMaker Irrigation, LLC, your landscaping team, offers snow removal services for every budget. 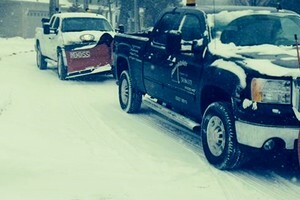 With our snow plowing and salting service, your property can be safer and more accessible. In addition to clearing the driveway or parking lot, the snow will need to be shoveled off the sidewalks. Salting is an effective way to remove those hard, slippery layers of ice. Deicing is important in our bitter winter climate, but there is more you should know. Salt spreading can melt snow as well as ice. It is often spread over lawns too. It is a much faster and easier process than shoveling or plowing afterward. Manufacturers recommend salting before, during, and after winter storms. So, do salt before storms so that the snow will melt quickly as it falls and ice will be less likely to form. It is much better to salt before because it is easier than removing snow and ice later. For more information about Snow Plowing & Salting in Howell, MI or surrounding areas, please call 734-564-1373 or complete our online form.